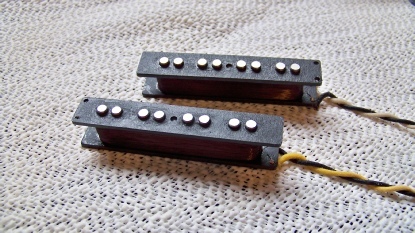 60’s Jazz bass pickups are scatterwound to replicate the first of the Jazz bass days of the early 60's . They have a warm,smooth tone with a punchy lower mids . ,Vintage pushback Lead wire ,Wax potted . Includes Black covers & hardware . 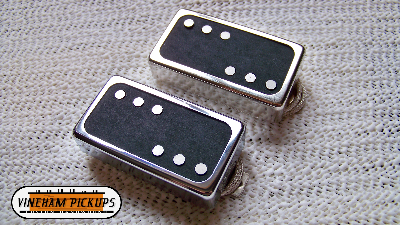 72's Jazz bass pickups are uniform wound,based on 70's Jazz Bass pickups that I've repaired. They have a tight bottom end with a more focused midrange punch,more balanced . Wound similar to the originals with Split Humcanceling operation . 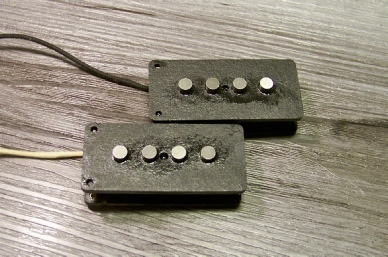 Alnico 5 magnets,Vintage pushback Lead wire ,Wax potted. The original bass from that era hand wound for the woody low end & very articulate midrange . 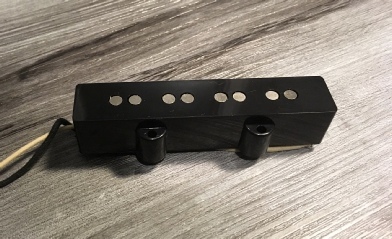 Zero-Sixty Noiseless Jazz bass Pickups now available in a few different of our jazz bass tones ,60's,70's & PJ .These are the split design . 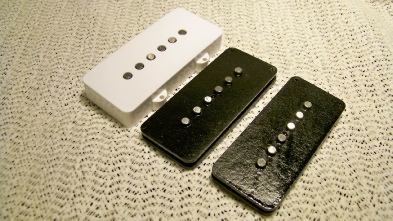 Our Jazzmaster pickups are based on one magical Jazzmaster that we have found . Even though we have had a few vintage samples from This Golden era in our shop ,this set has something special about it . 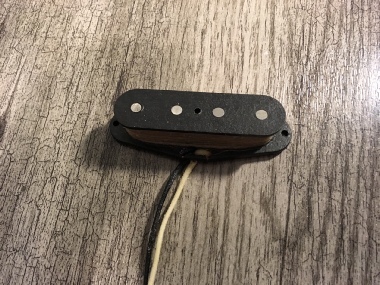 This was a 1960' Jazzmaster that had the Mojo .which I've learned that there have been major inconsistencies with the vintage pickups . These took a long time to replicate .The Right formula took many prototypes & did not sound nothing like the originals . We have finally replicated the Magic formula to give us the vintage tone . 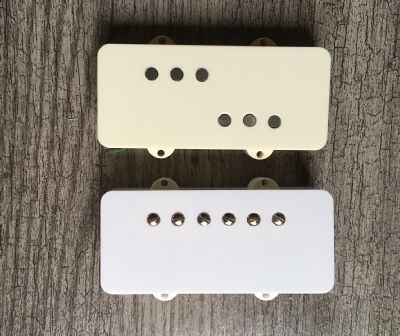 Our Jazzmaster have a very warm mellow but powerful tone with good clarity with that loose Bounce as all Vintage Jazzmasters should have. 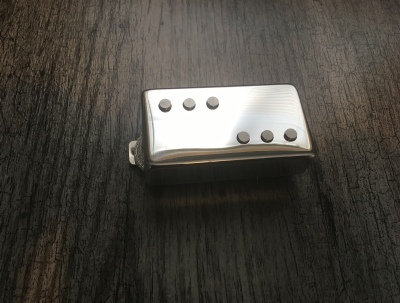 Alnico 5 magnets ,RW/RP for humcanceling combination ,Vintage pushback wire ,Waxed potted Comes with all hardware needed & choice of White or cream covers . 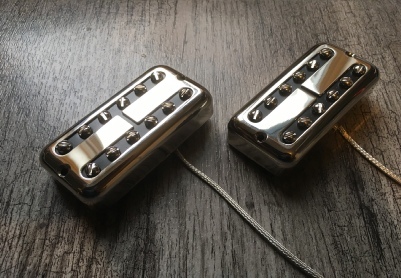 These recreate the Late 50's early 60's era Gretsch Filtertron pickups with that classic twangy rockabilly tone ,kind of in between a Twangy single coil & vintage humbucker . 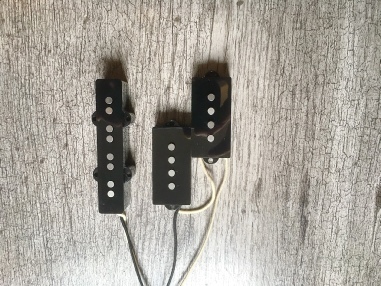 Please inquire about our Humbuckers to fit in a Jazzmaster ,Most of our models of humbuckers can be made to fit in a Jazzmaster including the Rockabilly.without any deepening of the pickup cavity .